If you are prepared to search, you will be able to located a good value hotel in Pittsburgh, with plenty of character. Now no longer the soulless industrial city that it once was, more and more visitors are choose to stay in Pittsburgh, looking for accommodation so that they can explore the many art galleries, and enjoy the allure of the surrounding countryside within state parks around Frankfort Springs, such as Hillman State Park and Raccoon Creek. 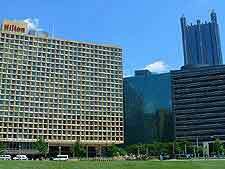 Downtown Pittsburgh is where the largest number of hotels reside, with the biggest brands tending to offering the most affordable lodging rates, particularly when accommodation is booked ahead. 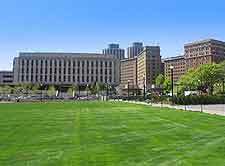 The Hilton is the city's biggest hotel with over 700 guest rooms, and is sited within the very heart of downtown's riverfront area, on Commonwealth Place, at Gateway Center and opposite the Point State Park. Whilst the Hilton may not be the cheapest hotel in Pittsburgh, it does offer an extremely high standard of lodging, with rooms overlooking the rivers and Heinz Field. For cheaper, good-value accommodation, consider the Best Western Parkway Center Inn on Greentree Road, which lies off the Interstate I-279 and is just 3 miles / 5 km from the downtown district. The Days Inn Pittsburgh is another very noteworthy budget hotel close to downtown Pittsburgh, being situated on Banksville Road and well-placed for those headed for the Mellon Arena or David L. Lawrence Convention Center. For the real bargain hotels, look for accommodation some 10 miles / 16 km west of central Pittsburgh, around the Moon Run and off the Interstate I-79 (junction 16 / Steubenville Pike). Here there are some very inexpensive chain motels and hotels, suiting the budget traveler and being conveniently close to Pittsburgh Airport itself. Even closer to the airport is the Comfort Inn on Banksville Road, the Hyatt Regency on the Airport Boulevard, and the Holiday Inn Express Suites on Campbells Run Road. 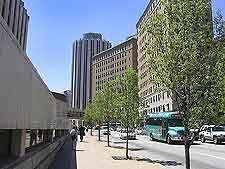 Those looking for accommodation within the vibrant university district will find that the Hampton Inn Pittsburgh University Center on Hamlet Street is hard to beat.